We were impressed with the Members of the Board at the meeting that took place on June 25, 2014. Board members showed a commitment to good governance and the Halifax Regional School Board’s mission, vision and values. We were pleased to hear discussion focused on educational outcomes of the students, safety and the importance of listening to public input. This was a good outcome for Park West and a good result in building public confidence in the Board. However, we believe there were significant issues with the Boundary Review Process and would like to offer some suggestions for consideration. We understand the Superintendent is considering a review of this process, so perhaps these comments will be timely and helpful. 4. Input from the Public. 1.1 Evaluation of requests from staff - Staff provided the Board with the following to support initiating the Boundary Review: “there is a positive migration pattern that has continued to cause increased enrolment for a number of years”. Reporting, such a broad statement with no additional information is not comprehensive enough for Board members to make a decision on initiating a boundary review, it does not support good decision making by the Board and breeds suspicion of the resulting decision and the motives of staff. Staff should be required to provide supporting data and information prior to requesting the Board initiate a Boundary Review – at a minimum this should include the past 5 years of actual enrolment and next five years of forecasted enrolment. At the same time Staff should be required to provide information on other relevant inputs such as programming, safety, etc. This would permit the Board to consider more closely whether the staff request is inclusive and that it aligns with the Boards objectives and values. 1.2 Comments by Board Members – On April 25, 2014 Chairman Gin Yee wrote an opinion piece in the Chronicle Herald indicating his personal opinion that change must happen at Park West. This was inappropriate as he made this statement in the absence of all available information including public consultation. It was also inappropriate as, given Gin Yee’s position as Chair of the Board, it would not be unreasonable to believe his comments could have an impact on other Board Members. Board Members should not offer comments in public forums as to what they believe the solutions to items currently under review may be, particularly when a process is underway to confirm and suggest alternatives. 2.1 Staff should provide the BRC with adequate materials at the inception of the process - This should include the BRC’s written mandate, contact information of the previous BRC Chair (so they can discuss what worked/what didn’t work so as to promote continuous improvement), copies of relevant HRSB policies, historic and projected information on schools included in the review and info on other factors related to the included schools. We have been advised that in a number of instances, information requested by members did not materialize and in at least one case was instead provided by community members after they received it from HRSB though FOIPOP request. 2.2 The Board should maintain direct oversight of the BRC – A Board Member, possibly the Chair of the Policy Review and Development Committee, should be appointed to be the liaison with the Boundary Review Committee and the Chair of the BRC should report directly to that Board Member. 2.3 The Chair of the BRC should appoint his/her own staff – including the facilitator and the secretary. We recommend that these not be Halifax Regional School Board Staff, or past HRSB employees such as Terry Wadden, so as to limit conflicts of interest and perceived or actual bias. In addition, the roles of the BRC Chair, the facilitator and the secretary should be clearly defined. 2.4 Meeting organization – HRSB staff, principals and the facilitator should not sit at the main committee table as they are simply there to be a non-voting resource. The current BRC saw open discussion from almost 30 people with staff having a significant voice in swaying decisions. A committee of this size is almost guaranteed to be ineffective and certainly frustrating to work within for its members. In addition, BRC meetings should include an in-camera session that excludes HRSB staff, principals and the facilitator to ensure the voting members are able to speak freely in the event they do not feel comfortable to do so in the open session. This should not be optional as optional in-camera sessions can cause undue concern and friction when they are called on an ad-hoc basis. The BRC should hold its meetings in a venue that is accessible to the public and provides for a recorded discussion similar to the HRSB chambers. The meetings should also be open to the public. Sanitized committee minutes were a concern with the most recent process and as with the HRSB meetings, recorded sessions provide an added level of transparency. 2.5 Provision of information by Staff - Staff should be required to provide additional information as requested. There were problems in obtaining information requested from staff during the most recent boundary review. To the extent the information is not forthcoming from Staff, the Chair of the BRC should contact their liaison at the Board and the BRC process should cease until the information is provided. 6.1.10 Student transportation and safety. However, as noted by Dave Wright during his comments to the Board at the June 26, 2014 Board Meeting, the impact on the education of the students should take paramount importance when evaluating options. Finally, the final report of the BRC should be submitted and presented directly to the Board. 2.7 Public access to materials of the BRC – all materials reviewed and received by the BRC (including but not limited to minutes of the BRC and input letters from members of the public) should be made public. Minutes should be made available within 1 day of being approved. All relevant information related to the above criteria, student populations, demographics, etc. should be made immediately available on the website in a structured, easily accessible manner, to allow the public to perform their own review. This is the best option to solicit quality public input for possible scenarios while maintaining transparency. 3.1 Provision of timely information – Staff should be required to provide the information required to the BRC at the start of the process. 3.2 Provision of consistent and well explained information – Staff should be required to fully explain, cite their sources and provide calculations of any information they provide on capacity. This was not done during the past review and in fact, staff provided revised capacity numbers on the night of the final Board meeting, highlighting the need to provide this information on a more timely, detailed and accurate basis. · Directing committee members to recommend a change (without any comparative analysis as to whether a change was required or would be preferable to the current boundaries). · Failing to provide information requested by committee members and directing committee members not to disclose committee discussions with their respective school communities – with the exception of three key messages determined by HRSB staff (prior to subsequently disclosed Minutes). 3.4 Financial impact of recommendations - board staff should be obligated to provide realistic cost implications for any scenarios that a boundary review committee is considering recommending. We recognize that a balance is needed between requiring too much up front, but sometime before a final recommendation is formulated, the BRC and the Board need to know the cost implications of recommendations. 4.1 Public input – Public meetings were heavily one-sided rather than promoting productive dialogues. In addition, the exclusion of the public from the actual BRC meetings is not a transparent process. The purpose of public meetings should be made clear (i.e. is the meeting for information only or is input being sought). The BRC meetings should be made public as they are debates involving public institutions. 4.2 Public disclosure - Questions or comments sent into the BRC were not published on the BRC website, nor were their answers. This is in direct contrast to a pledge made early in the process recorded in their February 10th minutes as "Questions submitted are being answered and will be made public". Correspondence should be made public as it involves comments on a publically funded institution. Halifax Regional School Board Policies regarding enrolment in the Park West catchment area are not being enforced and they should be by requiring that proof of residency in the boundary be requested via a power bill or other definitive forms of documentation. This should be done every year, in particular for schools that the HRSB has identified as having high enrolment. It makes no sense to consider making changes to any of the schools involved in order to address capacity issues if the effect of the changes could be effectively overridden by families who chose to send their children to schools outside their boundary areas. Armed with that information, the community and HRSB can have an informed discussion on capacity with the knowledge that if decisions are made, and boundaries are enforced in the future, the resulting school populations at the schools involved will be in line with expectations. Given the high level of disruption that a Boundary Review causes for a community we request that the motion with respect to Park West be amended to note that there will not be any further Boundary Reviews for Park West in the next four years unless there are material increases to enrolments and/or the Province of Nova Scotia imposes mandatory changes in grade configurations or class size caps resulting in the impossibility of delivering the required curriculum. Congratulations on keeping your school community intact. I know this has been a long and emotional process for many of you and I am glad the issue has been resolved. Through your actions and persistence, you have shown that Park West is more than bricks and mortar. It is the center of an active and thriving community. There are several lessons to be learned from your experience with the boundary review process. I am hopeful changes can be made to make boundary reviews less divisive and more consultative. Congratulations again. Have a safe and happy summer. Park West School will remain P-9! "It takes a village to raise a child" quoted by board member Kirk Arsenault as he spoke in favour of the community of Park West. We are fortunate to have such a village. HRSB Member Sheryl Blumenthal-Harrison represented her constituents, our community, exceptionally with this Boundary Review. We would like to extend a special thank you for all your support with this very difficult process. Board Members, Kirk Arsenault, Sheryl Blumenthal-Harrison, Christy Linders, Cindy Littlefair, Steve Warburton and Dave Wright, voted the motion of staff down to result in Park West School remaining P-9. The community can finally rest peacefully knowing their students will continue at Park West School and that the battle has been laid to rest. Six months of upheaval, a battle that seemed like a marathon that would never end, but the effort aided in accomplishing a result for our children that our community can be proud of. THANK YOU TO ALL WHO TOOK AN INTEREST IN OUR CHILDREN, STOOD UP FOR WHAT YOU BELIEVE IN AND WAS HAPPY TO LEND A HAND WHEN A HAND WAS NEEDED. Superintendent Elwin LeRoux goes against all recommendations and public input to steam ahead with the TARGETED Plan to dismantle P-9 Schools. Late Friday night the HRSB posted the staff’s final report and recommendations. In a baffling and unprecedented move, HRSB staff is recommending to the Board that the work of the Boundary Review Committee and all public input be ignored. Instead, they are recommending HRSB staff’s preferred approach to Park West – the removal of Grades 7-9. The HRSB staff report contains no detail to support staff recommendations and fails to address educational benefit, safety risk, financial impacts, transitional impact, renovation requirement, etc. and yet Mr. LeRoux and his staff are willing to suggest students are to be moved to Clayton Park Junior High with no good reasons provided. Why? Why pretend that the Student Advisory Council (SAC) has a legitimate role in this process, and waste 12 people’s time and good will for five months to simply ignore what they have diligently worked towards recommending? It appears a decision was made well before the review proceedings began so, why pretend that the Parents and the Community members actually have a voice? Is Democracy being followed? It doesn't appear to have a place with the Halifax Regional School Board. As parents we entrust our children to the Halifax Regional School Board to provide them with a good education and to consider their best interests. This is not happening; we must stand up, speak out and make a difference. We need everyone out to the June 25th Board Meeting and to Protest if needed. This is the most important of the three day meetings. If you are willing to speak, please request a spot for either the June 23 or 24th date with Selena Henderson by calling 464-2000 ext. 2324. You may need to insist that you wish to speak and Chair Gin Yee has advised the community that anyone wishing to speak will get the opportunity to speak. Please email everyone you know and ask them to come out and support keeping Park West P-9 and Protest changing the school to P-6. We need everyone in attendance on June 25th, @ 5:30 PM. HRSB – 33 Spectacle Lake Drive, Darthmouth. 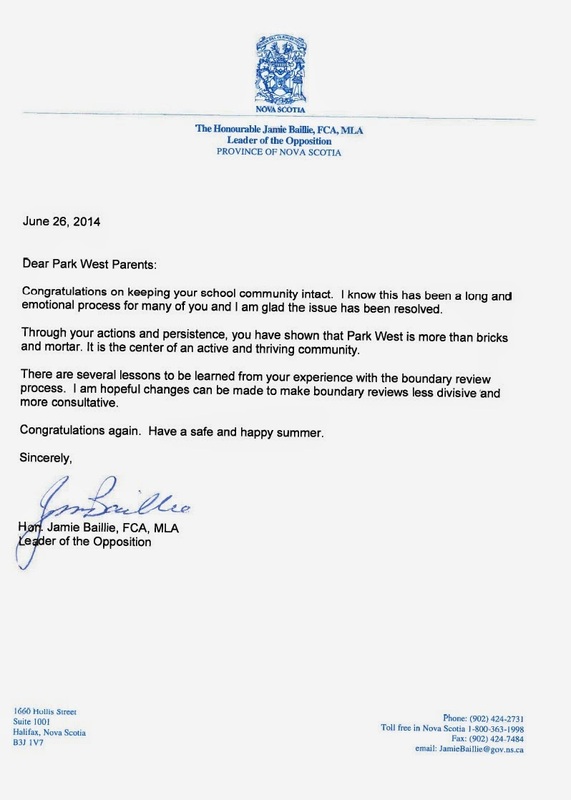 Thank you and see you on June 25th to save Park West School. IMPORTANT - To Keep Park West P-9 - The Governing Board Must Hear From YOU! Interested in Keeping Park West School P-9? The HRSB Governing Board Needs To Hear From You! 902-464-2000 ext. 2324 by NO later than Friday June 20th. The agenda with the recommendation report for both Park West School and Grosvenor Wentworth Park School will be posted on the HRSB website, Friday June 20th, for your review only. The best way for you to ensure YOUR voice is heard and YOUR concerns are addressed is to attend, speak and show support for your child, our Students, our Community and our School. No Good Reason to Propose Change! Last night at the final meeting of the Boundary Review Committee, the members voted to recommend Status Quo for Park West School. The vote was virtually unanimous with a 12 for the Status Quo and 1 abstention. When the Students, Parents and Community members finally got their chance to speak, the Committee was overwhelmingly convinced that the school should not be subject to change. The risks to the student’s safety, effects on academic achievements, leadership opportunities, after school activities, etc. were far more important than removing the junior highs. The Committee could find no good reason to propose change for Park West School. The opportunity to bend the ear of the Halifax Regional School Board will happen on Monday, June 23rd, at 6:00 PM and June 24th @ 6:00 PM. These are the dates set for Public Presentation submission to the Governing Board Members. It appears the Vote will be on June 25th at the regular scheduled board meeting. All parents, students and community members are encouraged to express the same and more positive messages that they did on the night of the public meeting for the Boundary Review Committee. We need to inform all board members of the importance of keeping the junior high in the community. Mark the date on your calendars, and register your name with Selena Henderson at HRSB, and Save Park West P-9 by speaking up and having you positive messages heard. A special thank you to Janet Lee and May Elsherif, SAC representatives. Progressive Conservative Education Critic Pat Dunn is asking The Education Minister to Act now on behalf of the Students of Park West School. HALIFAX, NS – Progressive Conservative Education critic Pat Dunn is calling on Liberal Minister, Karen Casey to act now to ensure Park West students are treated fairly. In November 2013, the Halifax Regional School Board approved a motion to complete a boundary review for Park West School. Scenarios proposed to the boundary review committee include moving grades seven to nine to other schools in the city. Parents’ groups have also gone on record indicating that their concerns are not being addressed. A complicated and emotionally charged issue, Dunn is calling on Minister Casey to facilitate a meeting between the department, the school board, and concerned parents. He suggests with open and transparent dialogue, the best decision can be made for the children attending Park West. Diana Whalen, MLA for Clayton Park West, has not been actively involved in promoting a solution to this issue. Why would a Boundary Review be initiated to Include Park West School?